ABUJA, NIGERIA (ASSOCIATED PRESS) — West African leaders promised Saturday to enforce the results of a Gambian election that was won by a challenger but is being rejected by the country's longtime coup leader. A summit of the Economic Community of West African States ended with all leaders stating they will attend the Jan. 19 inauguration of Gambia's new president, former businessman Adama Barrow. They also pledged to "guarantee the safety and protection of the president-elect," who has said he fears for his life. Gambian President Yahya Jammeh surprised his fellow citizens by conceding defeat the day after the Dec. 1 vote, and then changed his mind and called for a new election. The United Nations, the United States and the African Union have all condemned the move. The summit Saturday in Abuja, Nigeria, attended by 11 presidents with Jammeh absent, agreed "to take all necessary actions to enforce the results" of the Gambian election. It called for Jammeh to accept the results and refrain from compromising a peaceful handover of power. It named a mediation committee headed by Nigerian President Muhammadu Buhari with his deputy Ghana President John Dramani Mahama, who conceded defeat in an election a few days after Gambia's. It was Ghana's first electoral defeat of a sitting president. 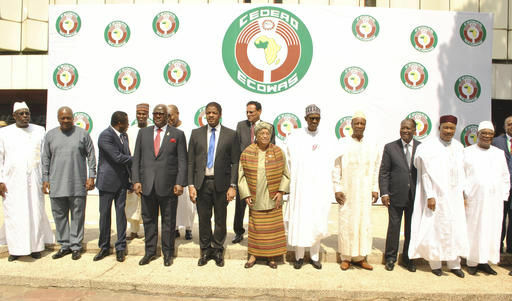 The president of the West African community, Marcel de Souza, said this week that if diplomacy fails, a military intervention and "draconian measures" must be considered for Gambia. He spoke in an interview with Radio France International. Jammeh's defiance challenges the first regional community in the world to agree to military interventions in member states accused of abusing human rights and democratic principles. It has spent 25 years nurturing democracy in a region once prone to military coups. Jammeh acted after an opposition coalition official in Gambia said he should be prosecuted for gross human rights abuses. Jammeh is accused of arbitrarily detaining, torturing and sometimes killing political opponents. Jammeh used the excuse of errors in the vote tally, ignoring the country's Independent Electoral Commission, which said the winner remains Barrow, who won with a revised count of 227,708 votes to Jammeh's 208,487. The ruling party filed a court challenge against the results Tuesday, a constitutional move complicated by the fact that Gambia's Supreme Court does not have a quorum. The United States said it doubts it is "a credible court dedicated to ensuring the integrity of Gambia's democratic process." Jammeh on Tuesday sent troops to take over the electoral commission's office in Banjul, the capital, shortly before a delegation of West African leaders arrived on an inconclusive mission. Jammeh seized power in a bloodless coup in 1994 in the country of 1.9 million people known for its beaches.